According to the Alzheimer’s Association, more than 5 million Americans currently have Dementia, with Alzheimer’s Dementia being the most common. Over 5 million caregivers are unpaid and devote countless hours to care-giving every year. All this while working and taking care of their own families. In fact, many caregivers are forced to take on a second job in order to help cover their loved ones expenses incurred by their illness of Dementia. As one can imagine, over time, the stress of care-giving begins to take a toll, both financially and emotionally, and caregivers’ health begins to suffer. Although stress is a normal part of everyone’s life, experiencing stress over a long period of time can have a negative impact on your health. It can lead to increased stress or anxiety, depression, obesity, a weak immune system, poor memory and concentration, and chronic conditions such as diabetes and cancer, and heart disease. In my experience in working with caregivers, the concept of self-care has seemed like a foreign one to them. More often than not I hear statements such as, “I just don’t have the time”, “I feel guilty doing something for myself”, or “I don’t have anyone to help me”. 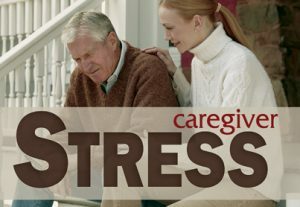 Getting caught in the day-to-day rut is very common but it is vital to your mental well-being and health to be aware of the ill effects of caregiver stress. So how can we ensure this takes place? Get a Handle on Stress! Get Involved – Contact your Alzheimer’s Association chapter. Learn about the respite services they provide, Adult Day Care centers in your area. Getting some space is important in order to recharge your batteries and feel like you have a better handle on things. Join a Support Group – You are not alone. Find a caregiver support group in your area. You will find that talking with other caregivers can help with normalizing and validating your caregiver experience. By sharing stories with others, you can also learn tips on how to cope with your loved one’s behaviors. Enlist Help – Doing everything on your own is exhausting and will ultimately lead to caregiver burnout. Ask a family member, friend, or neighbor to assist you with staying with your loved one once a week so that you have time for yourself or simply run some much needed errands. Exercise –It helps reduce stress and levels of anxiety and it doesn’t have to be time-consuming. Take 10 minutes out of your day if you don’t have time for more. Take a walk, do yoga, dance or even garden! You will find that you will feel better just by spending a few minutes out of your day on physical activity and doing something that you enjoy. Get Regular Check-ups – Doing so is not only advised but necessary. Simply put, what would you do if your health declined to the point that you could no longer care for your loved one? Eat Properly – We all know that stress can lead to unhealthy eating, weight gain, and poor health. Make sure to eat a well-balanced diet as this will keep you strong and give you energy. Get Sleep – Poor sleeping can lead to irritability. Ensuring a sleep routine can help you get the rest you need. Socialize – Staying connected with friends and family is highly recommended and can help you keep sane. Again, even if you can only carve out 30 minutes a week, just do it. You will find that it will make you a happier and better caregiver in the long run. Aside from the above-mentioned, making a habit of using relaxation techniques on a regular basis can help with reducing your overall levels of stress, strengthen your immune system, and reduce your risk of chronic illness. Below are four simple techniques that you can practice on your own and do not require you leaving your home. Breathing Exercises – Take a deep belly breath. Focus on your breath. Hold and count to four. Release meanwhile envisioning your stress leaving your body. Repeat for at least 5 minutes. Visualization – Close your eyes and mentally picture a peaceful, calm scenery or place. Imagine what it would smell like, sound like. Indulge your senses. Meditation – You can begin with practicing for 10 minutes a day. Find a peaceful spot in your home. Either close your eyes or focus on an object. Keep in mind that thoughts are not true. Acknowledge your thoughts but simply allow them to flow without judgment. This process allows you to let go of all stressful thoughts. Progressive Muscle Relaxation – Tighten and relax each muscle group, starting at one end of your body and working your way to the other end. Seeking help from a Therapist can also be extremely beneficial.